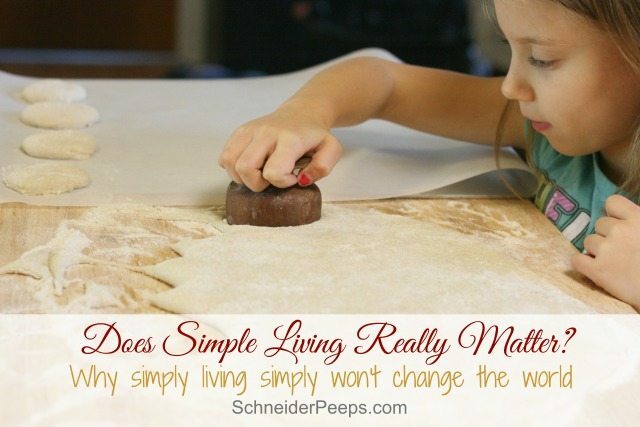 Home » Does simple living really matter? 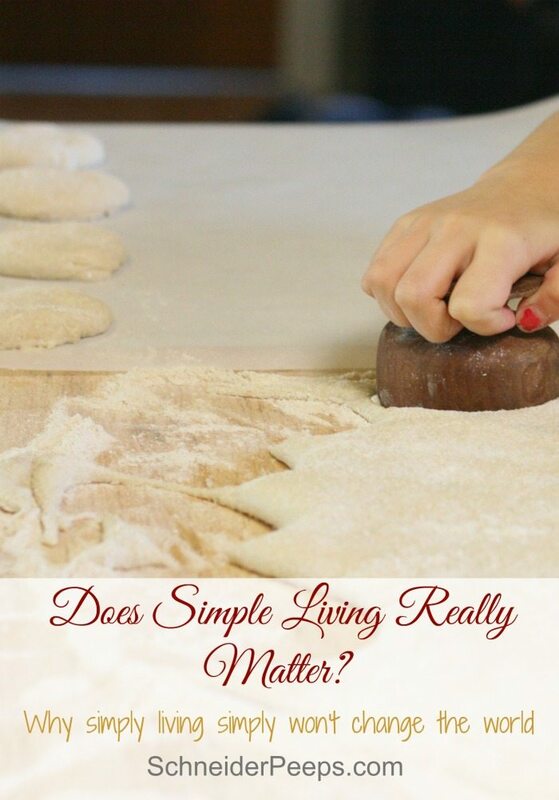 Does simple living really matter? For the last several months I’ve been struggling more than normal with living in a society of excess. Now, don’t get me wrong, there isn’t any other country I’d rather live in and even with all our “problems” it’s still a pretty great place that’s full of opportunity for all. We chose to live a fairly simple lifestyle and try to be a family that produces instead of just consumes. But the gnawing question I’ve had lately is does it really make a difference? During an online conversation with some other homesteaders about using resources wisely one of them mentioned a quote from Mother Teresa, “Live simply so others may simply live.” Apparently, that’s a quote that has been mis-attributed to her but it came to me at a time when we were trying to figure a few things out as a family. And now that I know Mother Teresa didn’t say it (although she lived it) I have an easier time disagreeing with the statement. Me choosing to live simply does not automatically help others simply live. When we use less water in our home that doesn’t mean there is automatically more clean water in places like India which desperately need clean water. 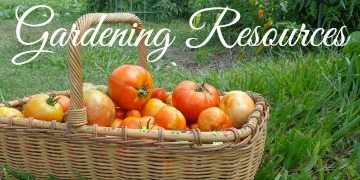 When we choose to grow more food and buy less at the store that doesn’t mean there is automatically more food at an unemployed neighbor’s home. When we choose to buy most of our clothes second hand that doesn’t automatically mean that there are clothes available to people in Africa who only have one or two sets of clothes. When we choose to limit the number of shoes we own it doesn’t automatically mean that there are more shoes for those suffering from jiggers. Our choice to have less does not automatically give someone else more. In fact, our choice to live simply doesn’t really affect anyone outside our home….unless we make it affect them. It’s not enough to live simply, we have to also actively make a difference in other people’s lives. But here’s the deal, not all help is really helpful. Sometimes what we (especially as Americans) think is helping is really just enabling or causing more poverty. Several years ago we read When Helping Hurts by Steve Corbett and Brian Fikkert and it challenged us to really think about our giving in a more careful way. You can listen to a great interview with the authors here. To complicate matters more for us, earlier this year Carl spent 10 days in Manila, Philippines with Metro World Child. 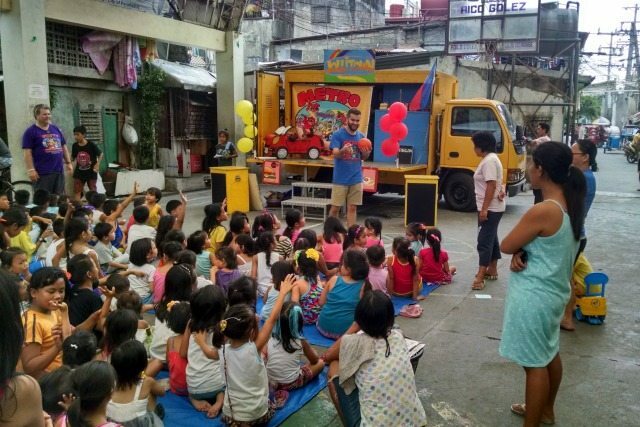 They ministered to children and families in HappyLand Tondo…sounds nice, right? Yeah, it’s actually the city dump and they also ministered to folks living in North cemetery. The need is so great, its overwhelming to me. And honestly, I usually get to this point in my thought process and just shut down from the weight of the reality. But here’s what I’ve come to realize…we can’t help everyone but we can make a real difference for a few. And that difference is possible because we choose to live a simple life. Because we choose to do things like grow our own food, buy second hand clothes and limit possessions we have “extra” money in our budget. We can choose to do many things with that extra money and today I’d like to share with you a few targeted things that we are choosing to do. Please know that I’m not sharing these things to say, “Look at us, look at the good things we’re doing.” I’m sharing because I think living a simple life for the purpose of living a simple life and thinking that it somehow has a positive affect on others just isn’t true. We have to actively make a difference in our world. The things your family chooses to support will probably be different than the things our family has chosen to support. And THAT is a good thing. Every family should wrestle with these issues and come to well-thought out decisions of how they are going to make a difference. This is by no means and exhaustive list. There are many organizations doing wonderful things all around the globe. Our family has decided on a few guidelines to help us decide what organizations to support. I encourage your family to do the same, it will make deciding what so support much easier for you. We were first introduced to Metro World Child when a friend’s college age son began working with them in New York City a few years ago. We’ve watched and listened as he has shared with us the difference MWC is making in the lives of children in the poorest areas of New York City and around the world. There are several ways that MWC ministers to these children, one way is by having sidewalk Sunday School almost every day of the week in different locations and another way is child sponsorship. While Carl was in Manila, he met a little girl that we are now be sponsoring. We are super excited to begin this new relationship and ministry. Sole Hope is a shoe ministry whose core purpose is “To effectively put in place preventive methods to combat diseases that enter through the feet and to create a positive physical and spiritual difference in the lives of individuals in impoverished communities.” I met one of the founders of Sole Hope, Dru Collie, at Alume Conference last fall – he helped lead worship. I was intrigued by the work they are doing. Uganda has a parasite in some of the soil called jiggers. They bore their way into a person’s feet, grow, lay eggs, become infected,etc. the only way of removing them is by digging them out. Part of the problem is that there isn’t much clean water in Uganda so washing the wounds is hard. In some parts of the country, a person with jiggers is shunned by the rest of the community because it is considered a curse…even if this person is a small child. 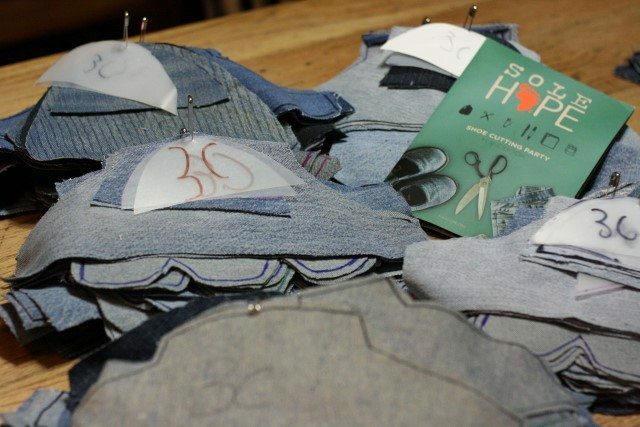 Sole Hope’s answer is not just to give shoes to people but to have those shoes made by local seamstresses and shoemakers who are paid a living wage. This helps the whole community. They also spray the ground in the homes and schools to kill the jiggers and they host health clinics where they remove jiggers, clean and bandage wounds….and give out shoes. Lastly, they share the Hope of Jesus Christ with the people. Bittersweet Monthly did a great video about the work of Sole Hope. One super easy and fun way to get involved is to host a shoe cutting party. Our homeschool co-op did this and we cut out 30 shoes to send to send to Sole Hope. Part of what made this a great group project was that those who couldn’t come could still help by donating jeans or money to help pay the seamstress and shoemaker. We also had children helping us and it was wonderful to discuss that not everyone has shoes like we have shoes and the importance of helping others. After seeing the video, Esther (our 7 year old) decided to donate her favorite pair of jeans all on her own- they are a size 4 and about 3 inches too short but she didn’t want to part with them…until she realized she could have them made into shoes for a child. My mama heart swelled. I have a feeling that Kristen had no clue the global impact this little maternity house in Kenya would make when it started. I first became aware of Mercy House through Kristen’s blog and I can honestly say there are times I just don’t want to open up the email. Not all of her posts are about Mercy House (she also writes about having a stronger family – all good stuff) but the ones that are about the work at Mercy House Global are hard to read. Mainly because sometimes I want to live in my own little bubble. But I can’t. For many reasons I need to read about their work and how I can help support it – I need to be reminded of how my worst day really isn’t all that bad, I need to be reminded to pray for those who Mercy House ministers to, I also need to be reminded that there IS something I can do to positively affect someone who is suffering. We have been getting their Fair Trade Friday boxes and use the contents to give as gifts. When we’re invited to a birthday party, it’s fun to go through our little stash and pick out something for that person. The cool thing is that each item has a tag attached to it mentioning the women who made the item. So it helps spread the word about the work that they are doing. We also buy our muslin bags for bath tea and for “thank you” gifts for our Etsy orders from them. Giving and making a difference doesn’t have to be through an organization, though – it just needs to be intentional. We have friends who moved here several years ago from Kenya. This year their girls wanted to have a birthday party (they’re becoming Americanized 😉 ) but in lieu of gifts they asked for donations so they could help pay for the school fees for a relative in Kenya. They raised enough ($336) to send a child to school for the whole year! What are some ways your family uses simple living to bless others? Hi Janet, I think that is true for all the programs. We can send letters and they will translate them for us. With MetroChild they have pastors who visit each of the sponsored children regularly and hand deliver the letters and check on the family. One day I hope to be able to go to the Philippines and meet her. Thanks for your kind words. I have stumbled across this post and feel compelled to share my take on the quote and how living simply CAN effect others. Maybe not instantly and without throwing money at a given issue. My take on the quote initially is that by reducing your impact on the world, you are allowing others the opportunity to find and have a place in the world. And I thought ‘others’ could refer to not just people, maybe moles or various weeds. Many fight the natural inhabitants of this world and making life more complicated. Example one, Moles. People don’t like moles in their yard and how it affects their lawn. The complexities we add just to have a perfect lawn take a toll on others. Moles are poisoned, some of that poison can be picked up by wild bird. Dandelions are sprayed, bees can get sick or die. By wanting to take control over our natural environment we create more chores for ourselves and difficulties for others. If we simply let our lawn be, maybe cut it for some necessary reasons, we would have the opportunity to let others simply live. By using less water, local environments would have more. The colorado river is currently decreasing in level, visually showing us that we are using too much water. If we use less of that water, there would be more in the river. That river then could sustain the wildlife that is currently surrounding it and for our future generations. Using less water now does not have an immediate impact, but will provide more for others in the future. By living simply, we can give another actual life by not killing it or providing more time/energy for someone to spend actually living the life they want. Example two, purchasing second hand. I do agree that by purchasing second hand it does not mean that others in the world would have clothes available or have more of it. It is by buying second hand, you are showing the economy that you do not need new. The demand can be reduced and thus the supply, hopefully. Or the supply could change from fast fashion, cheap clothing to more quality and one of a kind. The people in other countries making the new clothes could work less or maybe at a comfortable pace and hopefully for more money. Some may say that it creates more jobs and gives the opportunity for more people to work. But why do they need to work and have more money? To buy more stuff? I think it is difficult to know what exactly would happen if the majority stopped purchasing cheap goods, but I would imagine that it would have an effect on others’ lives and hopefully for the better. Our choice to have less could provide someone with more, not more products but more time. Time to spend providing for oneself or sharing with others. I would also hope that if we were to reduce our consumption on unnecessary items and focus more attention on sustainable food production, that it would have a great impact on many lives. 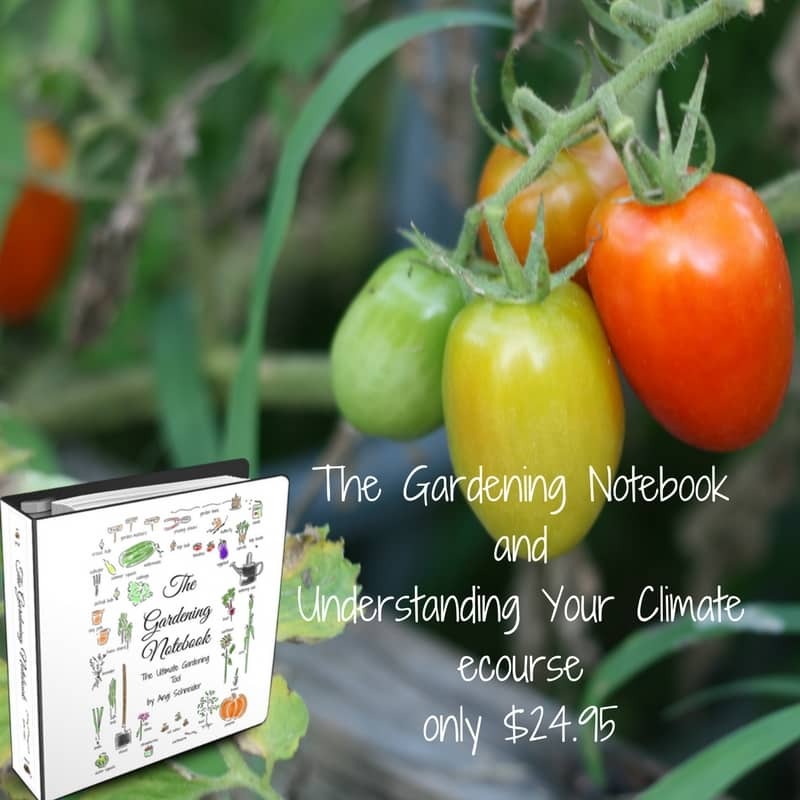 Specifically permaculture. To become aware that our current food production methods do not provide for others, meaning non human, would play an important role in how we can allow others to live if we live simply. I simply and respectfully disagree. Hi Emily, It might surprise you to know that I actually agree with almost everything you wrote and I appreciate you sharing your thoughts. 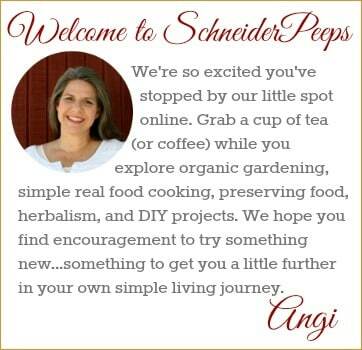 Absolutely consuming less, using fewer chemicals, etc. has an affect on our environment which in turn effects not just humans but the creatures we share the earth with. When I see photos of HappyLand Tondo (http://bit.ly/1YH5L2m) I am reminded of how important it is to reduce my family’s impact on the environment. But it also compels me to help. I wonder how I can live in “luxury” and turn a blind eye to the suffering of my fellow man. These are the kind of internal struggles that I have. Also, you ask “But why do they need to work and have more money? To buy more stuff?” Most people around the world do not work to buy stuff. That is a First World issue. Most people around the world work to survive. They want to work. They work so they can feed their children ONE meal a day. They work so they can buy their child a pair of shoes so he/she can go to school. They work in order to keep from having to prostitute themselves or their children in order to survive. Like it or not, money or some kind of “barter” is a part of life. And I’m happy to work hard and live a simple and frugal life in order to “throw money at a given issue” when that issue means that I can help another person live a life of dignity. I often wonder what would happen if every person in a First World country decided to use their “extra” (time, money, resources) to help just one person in a Third World country simply live? Thank you for sharing this. I followed the links to Mercy House Global and was really touched by the work they are doing. 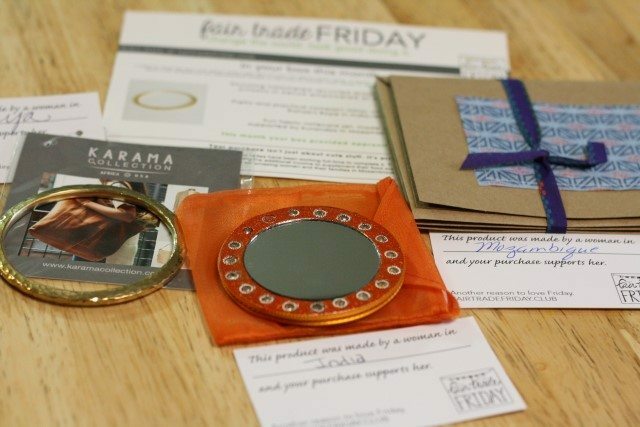 I signed up for the Fair Trade Friday box and can hardly wait to get my first one. I appreciated your suggestion of gifting some of the items. I love the idea of buying something that can have such a positive effect on someone’s life. I’m so glad; I think you’re going to love the boxes. The work they are doing is really amazing. Your post is clear and well thought-out and I am in complete agreement. I think we are often fed empty lies about how we should give and impact the lives of others, but what you said holds weight! Thank you. Thank you for your sweet words, D’Ann. This is a very thought-provoking post. I’ve been thinking about how I can teach generosity and kindness to my children, and really, the best way is through example. I feel so overwhelmed with “Living Simply” and also fighting a corporation to defend my property that I don’t think we’ve exemplified giving at all. But even something as simple as cutting out fabric is something the kids can participate in, while making a difference. I’m not in a fight over my land and I find it overwhelming too. I can’t imagine how much emotional energy that takes out of you! We really enjoyed doing the Sole Hope project with our homeschool group because it really is something tangible that our children could do that makes a huge difference. I’m sure you’ll find what your family is supposed to and I can’t wait to hear about it. Thanks, Heidi. It is so tough to decide and I often get overwhelmed by the needs. It’s so much easier to just pretend that there isn’t any needs and if I just live a simple life somehow all will be well. It’s such a balance.